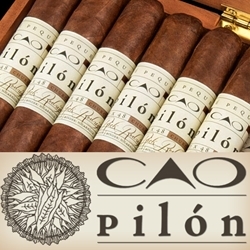 CAO has come up with a unique name for their latest premium cigar line, CAO Pilon. Named after the "Pilón" which is a tobacco process dating back to 19th century old-world Cuban traditions of tobacco fermentation. The traditional pilon method is when 10-15 tobacco leaves are tied together placed in a giant square stack, and left to ferment with the right amount of ambient temperature. The process used for CAO Pilon cigars is called the circular pilon. This is more time consuming because stacks of dried tobacco leaves are meticulously placed in a circular patterns, carefully layered on top of each other helping the process of fermentation of the tobacco to maximize the flavor and color of the leaves. Each CAO Pilon is carefully crafted in a robust Ecuador Habano wrapper, with binders and fillers from Nicargaua. These hand-rolled premium cigars are medium-bodied and exceptionally flavorful, giving every cigar connoisseur who lights one up an extremely satisfying smoking experience. Smokers Discounts believes you'll really enjoy CAO Pilon premium cigars. We’ve made it easy and affordable to buy these handmade cigars online and have them delivered right to your front doorstep. A variety of sizes and flavors are listed below in our online cigar store. Each of these styles are in stock and available today for a low discount price. Call us for more details!